He was brought up and educated in Saudi Arabia.He was born on 23rd February 1982. He has pursued a degree in Hotel Management. Karan's parents and his brother, stay in Delhi. He is punjabi. He was born in a Sikh family so he is a sardar. On December 2, 2008 he married his long-time girlfriend, Shraddha Nigam, in Goa in a Gurdwara. The whole ceremony was a private affair. Jas Karan Singh, who plays Uday in Miley Jab Hum Tum, is Karan's real-life cousin brother, who is about 20 days older than him. Karan Singh Grover is an Indian television actor and model. Karan was in the Hotel Industry until the acting bug bit him. Karan's roots date back to Ambala, where his father was born. He was born in Delhi and shifted to Al Khobar in the Eastern Province of Saudi Arabia with his family. He completed his schooling from the International Indian School. He also revealed that he has a younger brother who is a singer. 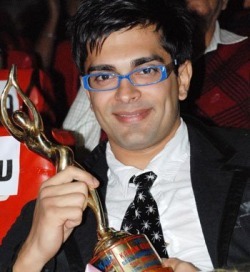 Later on, Karan traveled to Mumbai in order to trail a career in acting. He holds a Degree in Hotel Management and after coming to Mumbai, Karan worked with the Sheraton Oman in Muscat. Karan Singh Grover is fun loving and is a very calm person which is known to people close to him. He is extremely passionate about his work and is a very hard working,disciplined and a perfectionist.He has a sunny disposition and will always see the bright side of the bleakest possibility with a will power thats truly extraordinary. Karan got married on December 2nd 2008, to Shraddha Nigam, the love of his life. An actor with such dedication and talent is sure to go a long way in the approaching times. He started his career with TV serials like Kitni Mast Hai Zindagi Kasautii Zindagii Kay on STAR Plus, Solhah Singaar on Sahara One, and C.I.D. on Sony Entertainment Television, before doing the role of Dr. Armaan Mallik in Dill Mill Gaye on STAR One, which made him an instant star. He was a host on the STAR One reality television series Zara Nachke Dikha. He was (as of 27 February 2009) a semi-finalist in the dance reality show - Jhalak Dikhla Ja 3 - being aired on Sony Entertainement Television.